The CIT Premiere High Yield Savings Account is perfect for those who want to earn way more than the national average APY for their cash balances. CIT provides 1.55% daily compounding interest on all cash balances. When we started The Options Bro in early 2017, one of our sources of motivation came from the simple fact that there are genuinely good finance options out there, but so many consumers simply aren’t aware of them. If you’re like most Americans, chances are you have a savings account at one of the big three retail banks: Bank of America, Wells Fargo, or JP Morgan Chase. However, none of these banks pay more than 0.08% interest on savings account balances! This is not a joke. Currently, Bank of America, which is the second largest bank in the United States, pays an interest rate of 0.01% on savings account balances. On the other hand, if you had $10,000 in a savings account with CIT, you would receive a guaranteed annual payment of $156.20 by doing absolutely nothing. Although it may sound obvious, there is no risk for savings accounts; they cannot lose value. The best part is, CIT’s savings account compounds interest daily. CIT Bank offers pretty much everything that these three big, name-brand banks offer, but CIT pays clients 1.55% interest to put their money in an account that can be taken out at anytime. CIT’s CDs and money market accounts also have competitive interest rates; among the highest in the US. Typically, high interest rates on balances are only seen with online banks, but CIT Bank is not entirely online; there are several retail bank outlets in Southern California branded as One West Bank, which is a division of CIT. Therefore, given that you’re not losing anything by having an account with CIT, because they offer the same services as well known retail banks, you’re actually losing money if you’re continuing to keep uninvested cash with a bank that pays 0.01%. Without question, the 1.55% APY is the number one reason to choose CIT. It’s one of the highest APYs in the entire country, and is over 25x the national average, according to the FDIC Weekly national Rates and rate Caps. 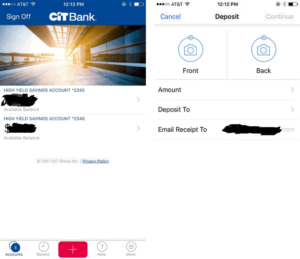 Say what you want about your favorite mobile banking app, but CIT offers everything you would ever need for mobile banking. Although we already have multiple accounts at CIT, we went through the process of opening up a new account for a CD, and the overall process was pretty easy and took less than five minutes. CIT’s online banking interface is simple and easy to understand, and we were easily able to locate routing and account numbers for transfers. Account statements are also easily accessible. At the end of the day, all on online bank really needs to do is pay you interest and keep your money safe. Unlike brokerage accounts, bank accounts don’t need to be used that often. As long as the functionality for mobile check deposits, wire transfers, ACH transfers, and mobile/desktop account history is there, most banks are actually pretty similar. Therefore, one of the biggest factors that makes or breaks a bank is the interest they pay their clients, and this is precisely what makes CIT. Open a CIT Bank Money Market account and get a 1.75% APY. See site for full terms and conditions on this offer.